Last night we witnessed a truly historic election. There is no denying that. A wild-card outsider candidate handily defeated an establishment political machine in a modern-day political upset and landslide. And while all elections are historic in a sense, there is no denying that last night’s election is one that will be analyzed, written about, and discussed for decades to come. Already this election is being compared to Reagan’s shocking upset and landslide victory of 1980. Was Donald Trump the perfect candidate? Of course not. As typical, high-level political candidates go, Trump was often unpolished and rough around the edges and, at times, brash and boorish in his mannerisms and behavior. Of course to many, these things were a large part of his charm and appeal. He was unlike any other major political candidate we had ever seen before. This is partly because Trump sold himself as the ultimate political outsider. He presented himself and his campaign as being largely self-funded, independent from the political establishment machine, and unbeholden to special interests. He was therefore unafraid to speak his mind in a way that very few high-level candidates ever could. During the campaign, Trump often “shot from the hip” when he spoke, unrestrained by the confines of traditional political etiquette and leftist political correctness. And in doing so, he was able to highlight many of the forbidden truths that a lot of men deep-down instinctively knew to be true. Trump had the courage and confidence to say aloud what many common men in America were privately thinking but were silenced from publicly speaking in the name of leftist political correctness and social justice. And as a result, the leftist narratives and stigmas began to lose their sting. For the common man was tired of being called a bigot, or a racist, or a homophobe, or a xenophobe, simply for daring to disagree with the modern leftist narratives. He was tired of being told how “privileged” he was by social justice fanatics, or how he was to blame for all of the problems and hate in the country. These were the same common men who had been cast aside and forgotten by the modern left’s globalist policies, and who are viewed with contempt by the elite and the establishment. Honest, decent, salt-of-the-earth men, long since passed over by the increasingly leftist Socialist Democrat Party, who finally became sick and tired of being berated and slandered just because they held traditional or blue-collar or religious values—Hillary’s deplorables. Trump understood and tapped into this sentiment. And thus presented himself as a representative and champion for the long forgotten common, working man. And the common man was watching. This was Trump’s brand of populism, a refocusing on America’s hollow men. He stood to represent their interests over the interests of illegal immigrants and refugees. And by that same token, represent the interests of America over the globalist establishment. Above all, Trump rekindled a long lost sense of American pride, patriotism, strength, and nationalism, in stark contrast to Obama’s globalist “citizen of the world” mantra. To many, this was a spirit that had been missing for a long time. Was Trump a conservative candidate in the traditional sense of the idea, a criticism that many of his Republican opponents and critics have been quick to highlight? Well that remains to be seen. In all honesty, and despite all the labels that his critics on the left have thrown at him, Trump is most likely a political moderate. I certainly don’t believe that he is as far-right leaning as I am. But in the modern world, where the political dynamic has begun to shift from left versus right to globalism versus nationalism, Trump tapped into exactly what he needed to. And for that, I agree with him. But as a candidate, Trump still had many faults and made many mistakes and missteps along the way. Self-inflicted errors which would have likely crippled or buried past Republican candidates. He also had to contend with an overtly corrupt, biased, and hostile establishment and media who were lightning fast to pounce on such errors, while at the same time digging up any past dirt and fabricating new outright lies. It is therefore not an overstatement to say that the full weight, power, and hatred of the political, elitist, and media establishment were aligned against Trump. Obviously he brought some of their criticisms down upon himself, providing his critics with ample ammunition with which to use against him. But nonetheless, there is still no denying that the establishment’s fingers were pressed heavily on the scales. Yet even in dismissing all of the hype, criticisms, distortions, and lies of the past campaign, Trump was still an imperfect candidate. He is an imperfect man, as is every man. Trump has his fair share of faults and very public mistakes. But sometimes history calls upon an imperfect man to do great deeds. Sometimes the wrong man can actually be the right man for a certain time and situation. Trump was not my first or perfect choice for a candidate, but today I find myself cautiously optimistic and hopeful. A feeling which is very rare for me. I don’t pretend to know what kind of man Donald Trump really is. I don’t know what is truly in his heart. Only God knows that. But as he matured as a candidate, and in the process became more measured and restrained, there did appear to be a natural, off-the-cuff honesty and sincerity about him, beneath his sometimes brash bloviating. Love him or hate him, he was certainly a far cry from the overly scripted and manufactured Hillary Clinton with her fake, robotic persona. That being said, I do not know what kind of president Trump will be or what the future holds. I don’t know if he is really just one big “con man”, as some of his critics have speculated. I don’t know if he can or will live up to all of his promises and expectations. Most importantly, I don’t view Trump as some sort of demigod who can solve all of our nation’s problems and the right the listing ship with a single wave of his hand—we may already be too far past the brink. And I certainly don’t view him as my personal savior or as the savior of the country, as many of Obama’s minions once did or still do. Trump is just a man, a man who is faced with some very great challenges ahead. But when you boil it all down, my primary take away from this election, and ultimately what I am most thankful for, is that evil did not triumph last night. That the corruption, criminality, and evil of Hillary Clinton were not rewarded by the American people. It’s that simple. It was reassuring to me to be reminded that truly wicked people do, occasionally, get what they deserve, and that evil sometimes does not go unpunished. I was relieved to see that there can occasionally be true justice or karma in the universe. All politics and policy and voting aside, when all was said and done and the final early morning election predictions were coming in, it was this simple notion which satisfied me the most. Hillary Clinton was, without a doubt, the most vile, insincere, corrupt, unethical, self-serving, treasonous, criminal candidate to ever seek the presidency. She had a resume that would make any mafia godfather proud. To deny this is to willfully deny and overlook decades worth of overwhelming evidence, firsthand accounts, logical conclusions, and the truth—all of which I have no intention of elaborating on here, but will instead refer you to WikiLeaks and other verified sources. Beyond all that, she was simply a malevolent person. You could see it seething in her eyes. So to finally watch her fail, and to see that her evil was not rewarded in perhaps the highest possible way, deeply soothed my soul. And yet, it did far more than that. I needed this. I needed to witness this. Now I will be the first to admit that I am a far from perfect man. Like all men, I have my weaknesses, faults, and failings. But I am a good and decent man at heart. And I am a man who deeply believes in and personally strives for, virtue, honor, and integrity. I am also a man who believes steadfastly in the fundamental principles of right and wrong and truth and justice. Although in my day-to-day life I frequently witness and experience things which often make me question whether or not such justice actually exists in the world. 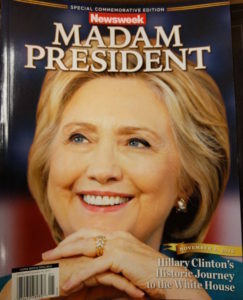 So to watch Hillary Clinton, a woman who has not only skirted consequence and punishment for her lifelong corruption and crime but has also profited and been rewarded by it, finally get her long overdue comeuppance, restored a small amount of my faith in the balance and justice of the world. It was nice being reminded that, sometimes, truly vile and wicked people do finally get what they deserve. In closing, I do not view the election of Donald Trump as the answer to all of the problems facing our country, for such problems are vast and deeply ingrained. I especially do not view this election as somehow being the cultural and political death of leftism, for the left always rebounds and regroups to push back again. The left never gives up or admits defeat. Nor do they ever introspectively seek to examine the error of their agenda or narratives, for they are religiously dogmatic. As I write this, leftist thugs, spoiled SJW college kids, and Soros funded rent-a-mobs have already taken to the streets in several major cities to “protest” in violent and destructive riots. And the mainstream media, so unabashedly biased and partisan in their initial attempts to destroy Trump and sway the election, have already begun to rehash the narrative that all Trump supporters are hateful, bigoted, racists. Thereby fundamentally failing to understand that such name calling and contempt for the common man was partly what contributed to the rise and success of Trump in the first place. Lastly, I do not view this election as some sort of massive groundswell or cultural shift back towards the right—although I would be happy to be wrong about that. I do however view the election of Donald Trump as a snapshot of cultural and political time, a perfect storm of circumstances, emotions, and people culminating in this moment. And Trump perfectly tapped into that moment. But more importantly, I view this as a start. A chance. A chance for those of us on the right to seize this moment and momentum in order to temporarily stop the damage, decay, and decline of our country. Now is not the time for us to rest on our laurels, for this victory alone is hardly enough to reverse the tide. It has bought us some time, but now the real work must begin. A Trump administration might be able to enact some successful policy changes, but the rest is up to us, the common and traditional man. We must positively affect and reclaim the culture, for politics is always downstream from culture. If the success of Trump has shown us anything, it is that we men of the right must be unafraid to stand up and call out the political correctness and false narratives of the left. Simply ignoring them will no longer suffice. We have done that already for far too long. We must now be open and bold in standing up to their delusions and insanity. We must mercilessly mock and discredit them while remaining unintimidated by their threats and insults. And we especially must no longer accept their false narratives or subversive conclusions; we must intellectually destroy them by promoting our argument, not by accepting the merits of theirs. Lastly, we must always lead by example in our own lives, by living and standing up for our values and principles. We must be role models of strength and virtue and traditional values. Donald Trump is not perfect, and his success as a president remains to be seen. But I take comfort in the fact that the American people did not reward the evil of Hillary Clinton, and that some justice was finally served. Trump is also not a demigod, nor the be-all-end-all answer to all of our problems. If he is genuine and successful in his promises, then hopefully he can enact some beneficial policies for this country. But at the very least, the election of Trump has given us common men an inspiration and opportunity to once again stand up to the left and reclaim our birthright.